Did you know that over 90% of pet owners say that their pet makes them feel happy and just over 88% of pet owners feel that owning a pet improves their quality of life? It’s no wonder that over 26% of UK households own at least one dog. One of the main reasons for dogs been so therapeutic and beneficial for people is that dogs fulfil a basic human need to have contact. It’s been shown that even aggressive criminals have displayed long-term changes in their behaviour and attitudes after having interaction and a mutual affection for dogs. I have been a dog owner now for over 20 years and have loved every minute of it. Our dogs can make us cry with laughter, provide us comfort in times of need and be our loyal companion no matter what our sometimes questionable life choices may be. Raising a dog successfully can be a challenge, but when done well you can reap the rewards of the special partnership you create between you and your dog. There are so many benefits to owning a dog, some of which are unknown to many people. So I decided to write an article to shed some light on some interesting benefits. So, read on to find out some thought-provoking advantages to owning a dog. Without my two dogs, I undoubtedly wouldn’t exercise half as much as I do now. My Wire-haired Vizsla Max and Border Terrier Pip, require a good hour’s walk every day whatever the weather or time of day. Dogs act as a huge motivation to get up and go outside and they won’t let you forget it! A study by Wu, Luben, and Jones (2017) showed that dog walkers were more active on bad weather days, with 20% higher activity levels than those who didn’t have a dog. Jones said, “If we could achieve that level of activity with everybody, it would go a long way in dealing with problems of obesity and ageing”. Studies show that not only are people with dogs getting more exercise, but they’re also getting better quality exercise by walking at a faster pace and covering more miles. Older dog owners are also found to be more than twice as likely than non-dog owners to continue to maintain their mobility and meet and exceed the government’s recommended guidelines for exercise. This better quality exercise can help lower blood pressure, help someone lose weight, manage type 2 diabetes, and owning a dog has been associated with improved one-year survival rates for heart attacks. There’s nothing I enjoy more than a Sunday afternoon walk out with the family and dogs. It’s a great opportunity to spend time together as a family, whilst engaging with the dogs practising recalls, finding things we might hide, encouraging socialisation and keeping up their (and my) fitness. Usual suggestions to reduce stress can involve exercise, meditation, yoga or a coffee with friends, but not many people would think that owning a dog could have significant reductions in someone’s stress levels. Dogs can provide a calming companion for people of all ages. One study compared the stress relief effects of a friend or spouse versus a pet on someone carrying out a stressful mental task. The results showed that people were less stressed when their pets were present compared to a friend or even their spouse! 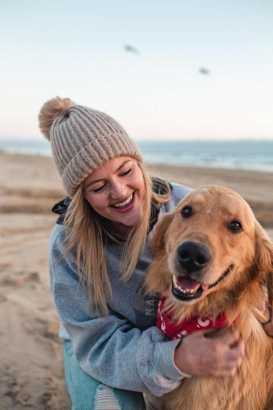 With this study, it’s no surprise that therapy dogs exist as they can help people to cope with stressful or traumatic situations by offering affection and comfort. I think the elderly and ill (to name a few) can gain so much from a visit from a therapy dog- there seems to a be a silent understanding between a dog and a person that can just brighten someone’s day to no end! As well as reducing any mental signs of stress, dogs have also been shown to reduce several physical signs of stress such as lowering your blood pressure. A study on stressed New York stockbrokers who had animals was found to have lower blood pressure and heart rates than those who didn’t have pets! I know my Max and Pip will always come and say hello when I’m busy in the office. It’s nice to know they’re about providing me with some company. If only they could write my reports for me! As well as dogs providing an added sense of companionship, they can also give you an added sense of security. Dogs have an extremely acute sense of hearing and an excellent sense of smell and will often alert you about an approaching visitor before you even hear anything. Whilst I don’t encourage aggressive barking at visitors, a few barks to ward off any wanted company can be reassuring. I notice that my dogs will bark at people at the door when my daughter is home alone which isn’t something I feel the need to discourage. Barking is proven to deter many burglars and acts as a very noisy, intelligent and reliable alarm. Dogs can make excellent protectors due to their extreme loyalty- they’re not called man’s best friend for nothing. With loyalty, also comes a protective quality which is an invaluable combination that not many other animals can match. Their protectiveness also stems from their wolf origins. Dogs have an instinct to self-preserve, meaning that they need to protect the one person who provides them with food and shelter etc. Having a dog around in the daytime or out and about is not the only time people feel safer with their presence. Studies carried out by a Sleep Clinic in Arizona has shown that having pets in the household makes people feel safer and more secure at night leading to a better night’s rest. I know our house would feel eerily quiet without the dogs being around. They can act as an effective physical deterrent to any unwanted visitors, as well as providing peace of mind so that you can sleep safely at night. I have met some wonderful people over the years by being involved in the dog industry, so there’s no denying that dogs can really help your social life. Who doesn’t love having a conversation about dogs anyway?! Dogs can help you meet new people. Even by taking your dog for a walk in the local woods or park, you often find yourself in conversations with another dog owner or a passing admirer. Every time I take Max out for a walk I am regularly stopped and asked what breed he is. Having something in common such as a dog can act as a great icebreaker, and if you keep meeting the same people on your walks it can easily lead to new friendships. You can also meet lots of like-minded dog people at agility classes, obedience classes or even at the vets. Opportunities can be endless. One study found that dog owners were 60% more likely to meet people around their neighbourhood and develop friendships than non-pet owners. Dr Lisa Wood says that “Pet ownership appears to be a significant factor for facilitating social interaction and friendship formation within neighbourhoods”. As well as developing friendships, dogs have been proven to build relationships too. If you’re in a relationship and own a dog, it’s proven that couples are more likely to be happy and settled as blood pressure levels are lower, and social interaction levels are higher. If you have ever worried that getting a dog may hinder your social life- then don’t! It may change your social life, however, owning a dog can present so many new opportunities to meet a whole different group of people so worry not. When I think about the main benefits of owning a dog, I would definitely say having a loyal companion by your side (24/7 if they had it their way) is one of the main ones. Companionship can help prevent illness and add years onto your life as isolation and loneliness can trigger symptoms of depression. Caring for a dog can provide you with a purpose, and therefore make you feel needed. Dogs prefer a structured routine every day, therefore, they can become a focal point for our attention making sure walk and feed times are met for example. Dogs can take away the stress and loneliness we sometimes all feel, especially if you live on your own and have no-one else to talk to. There’s no denying that we end up talking to our pets when we’re alone and need a bit of company. Older people enjoy having dogs around as a physical companion as they can get comfort from the presence of a dog being near. Caring for a dog also can induce emotional and physical relaxation. It’s now being proven by scientists that animal therapy and the presence of animals can reduce anxiety and feelings of loneliness. Researchers in North West America tested this hypothesis on a group of Undergraduate students. They introduced a trained therapy dog to campus for students to stroke, exercise and care for. After the students spent time with the therapy dog, they found a 60% decrease in anxiety and loneliness. This study certainly confirms how dogs can help those who may be lonely. Dogs are fun, playful and characterful. These characteristics can brighten up the day of so many, from young students to those in retirement homes. It’s often said that adopting a healthier lifestyle can play an important part in helping symptoms of depression, anxiety, bipolar disorder, and PTSD. As I have previously discussed, owning a dog can help reduce your stress levels and can make you more active. Dogs can also help you meet new people to reduce loneliness and encourage friendships. Exercise with your dog can increase your endorphin levels which can help fight depression. As dogs also need a routine, you’ll make exercise a daily routine for you and your dog. Research has proven that consistency in one’s schedule can help with stress, improve sleep and improve your overall health. Dogs have also been proven to give people a sense of self-worth. Research has shown that having responsibility can help mental health issues. A sense of responsibility can be beneficial as you have to take ownership and apply skills to a specific task. This can be related to taking care of a dog, as owning a dog can offer reassurance that you can take care of an animal and yourself. Dogs can bring extreme happiness into your life, and arguably depression will never be able to fight the unconditional love that pets can provide people. For me, one of the main joys I have experienced owning dogs is the partnership I have watched develop between my daughter and the dogs. Having a family dog can benefit children’s emotional intelligence and health according to several studies. Dogs can encourage children to have a much healthier lifestyle. Besides the obvious benefits of children being more active when playing and walking with a dog, research has also shown that children who grow up around dogs have less chance of developing allergies and dogs have even been suggested to have a probiotic-like effect on the human body. Having a dog can also teach children skills like responsibility, and increase a child’s confidence. Even young children can be given tasks such as filling up a dog’s water bowl or feeding them. Carrying out these tasks can then increase a child’s self-esteem by making them feel useful and worthy. Children can also slowly learn to read when a dog is hungry or thirsty for example, thus developing empathy skills. Empathy is often a skill many bullies lack, so it is an essential skill for healthy child development. As well as dogs providing invaluable companionship to the old and vulnerable, they can also provide unconditional love to the youngest members of the family. Dogs aren’t judgemental and can offer a child someone to talk to. My daughter is an only child so I think she definitely benefited from having a dog to play and interact with. Dogs can comfort and listen without consequence, and often have a calming effect on children. Growing up with a dog can also help children socialise and develop their verbal skills. Children often try to talk to pets whilst they’re still learning to talk. Just by the dog being present, they provide a verbal stimulus to encourage a child to practise talking and socialising. Dogs and animals, in general, can also be very therapeutic for children. I’ve already discussed how dogs can reduce stress, lower blood pressure and reduce anxiety in adults, but the exact same applies to children. Children can immediately trust animals, as animals don’t ask for any interaction or put any pressure on children. I believe children can sense an animal’s unconditional love and affection; making it a lot easier for children to trust them. If this article has shown you how great owning a dog can be, please remember that before choosing a dog, you need to carry out a lot of research to decide on a breed that’s best for you. Dogs can be like cars, varying from the Mini to the Ferrari. Ferrari drivers won’t want to drive a Mini, as much as a Mini driver wouldn’t want to drive a fast Ferrari. There are breeds who have great stamina and a demand for mental stimulation, whilst other breeds may just love to be your lapdog all day. Please make sure when choosing a breed of dog for your family, you research the breeds you’re considering and you speak to the breeder about your family’s lifestyle, so you can be sure the dog is the best fit for you and your family. You may find my blog post on recommended dog breeds for families useful to aid you with your decisions. It’s also important to note that you need to educate your child about a dog’s body language to read their feelings and always supervise child and dog interactions. Whilst there are so many fantastic benefits of owning a dog, I feel the need to remind you all that owning a dog is a lifetime commitment that you must consider ever so carefully. Dogs require an awful lot of time invested in them to ensure that they get the amount of exercise and training they need, otherwise, dogs can develop a multitude of behavioural problems due to a lack of mental and physical stimulation. Dogs need feeding, walking and caring for no matter what the weather or occasion- your dog’s happiness and well-being must always come first. With that said, with comprehensive research, you can trust to find a dog that is perfectly matched to your way of life and whose needs will be fulfilled within your home environment. I’d love to hear your opinions about the benefits of owning a dog, so feel free to comment down below.